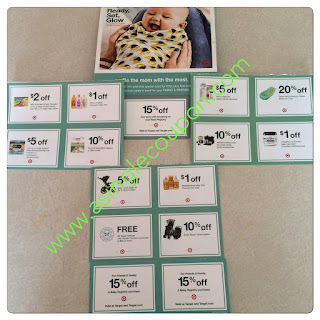 Target Baby Registry send's great coupons in the mail! I recently told my girlfriend who is expecting to sign up for a Target Registry, and about 2 weeks after she did she got these great Target coupons in the mail! These are Target coupons, so some of them pair up nicely with Manufacture coupons too! Tell your friends who are pregnant to sign up and get some great saving's! Here is what she got! Also some store's, like Meijer, will also accept the $$ coupons, but not the % off coupons! So you get 5 with the coupons plus another 4 close to your due date! Awesome, thanks for sharing!